As a regional affiliate organization of AIR, AIRUM serves to improve and disseminate research predominantly of concern to institutions of higher education in the Upper Midwest. AIRUM's goals are to provide avenues for professional development for AIRUM members, to provide a collegium for professional persons in institutional research and assessment, and to encourage association and involvement with the Association for Institutional Research (AIR) through AIR forums and other activities. We are a member-led and member-driven organization serving Iowa, Minnesota, North Dakota, South Dakota, Wisconsin, and the Upper Peninsula of Michigan. AIRUM is pleased to partner with ETS and offer a webinar to our membership on assessing student learning outcomes (SLOs). Dr. Javarro Russell, Director of Strategic Partnerships and Innovation at ETS and President of the Northeastern Educational Research Association, will be leading this webinar with particular attention to assessing SLOs across academic and student affairs areas. ETS’ HEIghten suite of assessments was designed to go beyond traditional literacy and numeracy assessments by capturing innovative constructs such as Civic Competency & Engagement and Intercultural Competency & Diversity. This presentation will focus on the development of these modules/tools, collecting data using these tools, and using data from these tools to improve the educational experiences of their students. Dr. Russell will also address common frameworks for assessing student learning, detail concerns regarding the quality of the data obtained during the process of assessing student learning, and discuss the process for reporting and ensuring appropriate interpretation of learning outcomes data. All current AIRUM members will receive a direct link to the webinar the week of the 17th; no pre-registration is required. For more information on joining AIRUM, see join AIRUM or contact AIRUM with any questions at [email protected]. Thank you for your interest in AIRUM, a regional affiliate of the national Association for Institutional Research (www.airweb.org) serving institutional research, institutional effectiveness and allied professionals in IA, MN, ND, SD, WI, and the UP of MI. AIRUM’s major event is an annual conference in Bloomington, Minnesota, usually during the first week of November. Conference registrants are automatically signed up as AIRUM members. Starting in November 2018, individuals can sign up or renew AIRUM membership for $25/year (membership year runs November 1-October 31) without attending the conference. Maintaining AIRUM membership grants access to members-only sections of this website, prior year conference materials and ensures that you receive notifications of AIRUM events. We are so thankful Dr. Nathan Grawe, Professor of Economics at Carleton College was our 2018 Keynote Speaker. 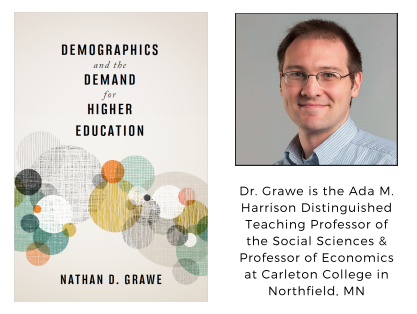 Dr. Grawe is a labor economist whose most recent book, Demographics and The Demand for Higher Education (Johns Hopkins University Press, 2017) examines how recent demographic shifts are likely to affect demand for higher education and explores how colleges and policymakers may respond to meet institutional and national goals. Read more about his nationally recognized work by clicking on the images above.